A pregnant mother Madeline Matheson, after loosing both her husband and unborn child in a accidental crash crash insists on carrying the baby to full term. After delivering the stillborn child, the baby mysteriously returns to life. Madeline returns home to care for the child only to find out her baby has an strong craving for human blood. Locked away from the outside world, Madeline struggles with her newborn daughter Grace, while her mother-in-law pans over how to get custody over her now deceased son's child. Paul Solet's "Grace" is a dreary and unique take on the zombie horror genre. The film moves at a very sluggish pace, however the story from the opening shot to the final frame keeps the viewer completely fixated as the startling story unfolds. Solet's story is fresh and innovative and does nothing but keep you utterly captivated as Madeline discovers what she has given birth to. Cinematographer Zoran Popovic delivers a poignant vision that beautifully matches Solet's eerie tone to the love story focused on a mother and her endless devotion to her daughter. "Grace" completely hinges on the performance of Jordan Ladd and she does a remarkable job in every facet to the dark performance. Ladd takes the portrayal from a glowing mother to a deprived spirit who is willing to try anything in order to keep her baby alive. She plays the role with precision and takes the viewer along with her as she comes close to the breaking point. One aspect to Solet's character development in Madeline that was refreshing was his ability to allow the character to naturally become her darkest fears. More specifically, the decisions and events that transpire within the final two acts in "Grace" do not seem forced in any way. I loved the way Paul Solet develops the story. He introduces Madeline, a character who is a staunch vegan and reminds herself daily on the brutality of killing animals for food. Watching Madeline forced to the realization that her child needs blood to survive becomes a motivating and absorbing endeavor that has you obsessed with seeing where the story will lead. I thoroughly enjoyed all of the twists and development that Solet scripted. Furthermore, by the time you reach the third act, you have become completely immersed in the rare breed of horror. "Grace" has an outstanding score that matches the eerie tone to the film flawlessly. The subtle baby hymns that Madeline sings to her daughter Grace are both touching and resurrect a uncanny mood similar to that of the Rosemary's Baby theme. I fell in love with the music which created a darkly somber mood and at the same time also provide a glimmer of light to the story of unmeasurable love. One downside to the film, was the baby. At times the fake babies that were used for the darker moments to the script immediately pulled my attention from the film. I can't blame Paul Solet for this either, considering it would have been unimaginable to put a baby through some of the scenes the fake babies were used for. The prop babies just did not look real in the slightest and in the end, became a thorn in my side while watching the film transpire. The supporting cast is fairly strong throughout "Grace" with notoriety going to Gabrielle Rose playing Madeline's mother-in-law Vivian. Rose was stunning throughout "Grace" and delivered a performance that would make anybody cringe in bewilderment. The rest of the cast seemed void of any emotion, which in hind-sight, felt like Solet's vision for the supporting characters. Stephen Park playing Madeline's husband Michael, Serge Houde playing Madeline's father-in-law and Malcolm Stewart who plays the Matheson family doctor all felt frigid in their performances. They all remain very somber throughout the film and do not have much in the way of character development. That said, the supporting characters are mainly there only to show a stark contrast between Madeline's highs and lows in raising her newborn child. Finally, "Grace" is definitely a must see in 2009. It is a fresh take on a genre of horror that has been stuck in only one way of delivering the material. 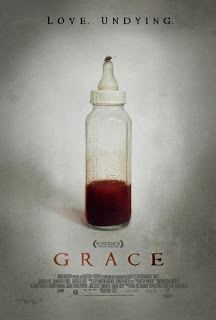 "Grace" is no typical zombie movie and it could be argued that it is not even a zombie movie at all. When broken down to it's root, it is a love story showing the extremes a mother will go to for her child. The film is enjoyable, startling and most of all, it sticks with you after viewing.